We Won't Do Easy. You Won't Forget It. As a runner we tend to be more prone to lower extremity injuries, particularly the knee. I personally had my share of injuries and have learned over time how to avoid recurrence of the ones I have been familiar with and how to prepare and avoid them…strength training, stretching, being observant of my running style, my footwear, the running surface and clothing… now ‘invincible’ and injury-proof …low and behold…. another running injury (!). The runner’s knee, aka patellofemoral pain syndrome (PFPS). Quite common in our world. Some have been lucky enough not to experience this. I thought IT-band syndrome (ITBS) was bad (well it was, is); but this is an injury that should not be ignored, just as any injury. affects 25% of all identified knee injuries. occurs disproportionately in active adolescents and adults in 2nd and 3rd decades of life. 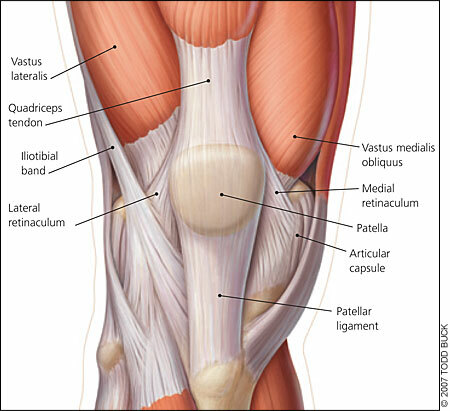 Anatomy The Patella is a lies within the quadraceps tendon and rides in the trochlear grove of the distal femur. 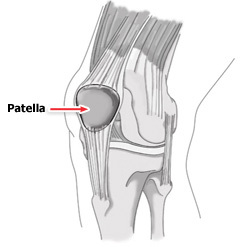 The Patella’s primary function is to improve leverage for knee extension. Their is articular cartilage on the underside of the patella as well as the trochlear groove (the patellofemoral articulation). Why would a runner get Patellofemoral Pain Syndrome ? Overuse, overloading, malalignment, and trauma are common factors. 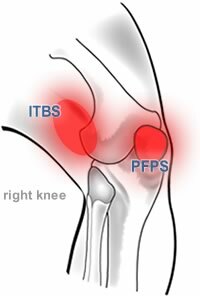 In theory it is the abnormal tracking of the patella upon the articular surface that causes PFPS. Overload – runner’s total mileage correlates with the development of PFPS. Patients with PFPS often report that symptoms began during a period of increased physical activity. Trauma Direct and indirect injuries also can contribute to developing PFPS pain. Diagnosis is based on history. Onset is gradual. Pain is poorly localized under or around the patella and described as achy and sharp; worsened by squatting, running, prolonged sitting (such as a car/movie), or when ascending or descending steps. Some may feel audible ‘popping’ or ‘cracking’ when moving the knee. 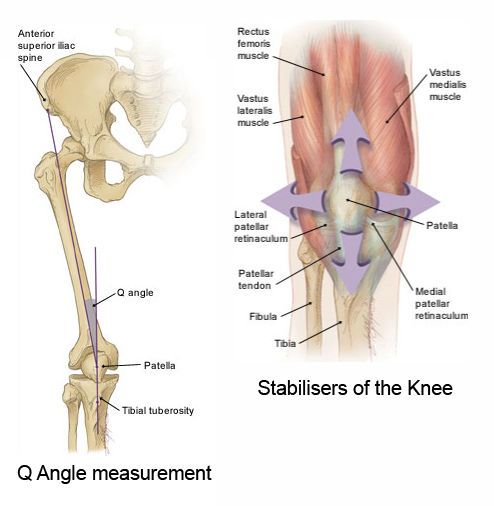 Some may feel the knee unstable (this perceived instability may be due to the pain inhibiting proper contracting of the quadriceps muscle and must be distinguished from other etiologies of pain such as meniscal or ligamental injury. Initial treatment is to improve the patellofemoral tracking and alignment, pain control, modification risk factors and bio-mechanics. Activity modification. Avoid activities that cause pain. Reduce running volume or, depending on the severity of symptoms, put a hold on all activities. Pain control: NSAIDS (Ibuprofen: advil, motrin; Naprosyn; Naproxen; or the like). Short term use (2-3 week) to help with pain and inflammation. No evidence to support the use of ultrasound, iontophoresis, phonophoresis, or electrical stimulation in the treatment or PFPS. Exercises to increase strength and flexibility of Hip abductors, iliotibial band, knee extensors (quadriceps), knee flexors (hamstrings), feet (in excessive or insufficient pronation), and core muscles. Hip abductor strengthening: (squat; leg press). Multiple observational studies implicate that hip abductor weakness in the development of PFPS. Quadriceps strengthening: Quadriceps muscle weakness is a common problem in those with PFPS. Squat and leg press are examples in strengthening exercises; also semisquat and straight leg raises. Core Stability: Core stability affect pelvic stability and is an important factor in preventing lower extremity injuries such as PFPS. Foot orthoses: can help control excessive overpronation or supination. Bracing and patellar taping: appears to be less effective in those with higher body mass indices. Useful if it helps symptoms so that one can perform rehabilitation exercises (since exercise and strengthening are key in the treating PFPS). Barefoot running and minimalist shoes: benefits may be due to gait changes such as shorter stride length and midfoot-forefoot strike may help lower rates of injury including PFPS. Corticosteroids injections: Little evidence to support the use in PFPS. stretches for the quadriceps, iliotibial band, hamstrings, and calves. I have personally been interested in learning about PFPS since I have experienced many of these symptoms which lead me to visiting my primary care doctor, who I have not seen for a while. I noticed the symptoms first while walking on my hand in knees playing with my daughter. First the crunching sound in my knee caps (patella); later with knee pain while sitting for a long time (theater (PFPS is also called theater’s knee) and mainly in a car) where I had to extend my knee, even while driving, since the pain was so severe (luckily it was my left leg). Extending my leg provided relief but was still painful enough that I thought it possibly may be a meniscal injury (tear). My doctor heard my story, examined my knee, and diagnosed me with PFPS. He provided me a regimen of exercises to follow consisting of repetitive hip extensions while externally rotate the leg in order to strengthen my medical quadriceps muscle. I did this as well as gentle leg presses at the gym (while I put medial traction on my patella (to help to track the patella correctly). I gauged the intensity of the exercises by how I felt: if I felt more pain, I knew I was doing something wrong; if it did not cause more pain, then I continued. The medial traction during knee presses did help relieve the pain so that I can perform several sets. I also did lounges with no weight initially, and then after several days I was able to add some (5-10 lbs each hand). Over time the crunching feeling and the pain improved, but it did take several months for complete recovery. I attribute my injury to my poor training leading up my first 50mi ultra. The pain did not occur till 1 week after the ultra and it was gradual onset. The ultra caused my quadriceps muscles to be very tight (mostly my lateral quads…causing the patella to track laterally). Regular quad stretching may have helped a little, but I still developed the symptoms. Even though I was saddened at the time to have another injury, I was somehow glad to have the experience so I can understand the symptoms related to this syndrome: prevent recurrence, use it as advice for others, and apply it in the clinical setting to identify it in others. Thanks for this info. It’s good to know what we can do to prevent these issues in our bodies. I recently suffered an injury and I am all about preserving, and doing what I can do to take care of my body so that it will allow me to stay active. Hi Tom! I’ve been having knee pain for about 2 months now (it seemed to really kick in after a 14 mile run on uneven snow/ice). I just ran a marathon yesterday and am pushing myself to take some time off now that it’s over (next full marathon isn’t until the fall). How long did it take you to get better? I know you mentioned a few months but did you stop running all together? Took appox a year to completely recover. 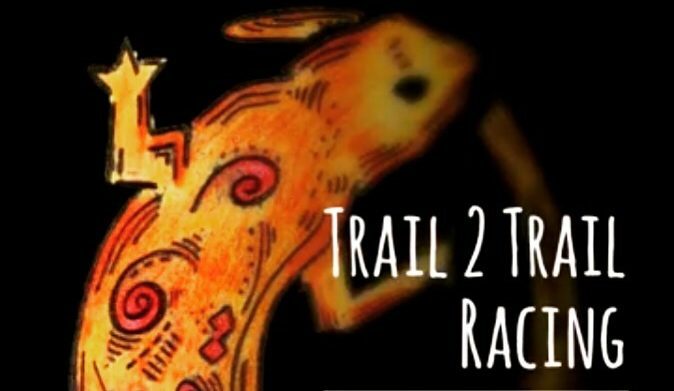 Trail running helped since the hills strengthen the legs at many different angles (strengthening quads and hamstrings) as opposed to road where you use the same muscle fibers over and over without any change in angle at the hips/knees where many muscle fibers are trained and others neglected most likely resulting in patella misalignment setting me up for failure.